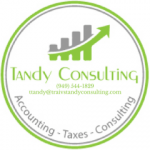 Travis Tandy of Tandy Consulting is an Approved Intuit Reseller and a Certified Quickbooks ProAdvisor. He is an expert in preparing taxes, accounting, and outsourced CFO services as well as reselling Intuit QuickBooks products, Revel POS Systems and more. For details on package inclusions and more pricing information, please click here. Work For Tandy Consulting? Claim This Page.